Food Costs > How Much Does Mozzarella Cheese Cost? How Much Does Mozzarella Cheese Cost? Mozzarella is one of the most popular types of cheese that is used today. The flavor is subtle with just a hint of saltiness. The price you pay for mozzarella will depend on the type, the amount you need and the store you purchase it from. How much does mozzarella cheese cost per pound? On average, a fresh pound of mozzarella cheese is going to range anywhere from $5 to $11 per pound. According to Oprah.com, fresh mozzarella from Murray’s cheese is $8 per pound. Shredded cheese, on the other hand, is going to retail for $2 to $5 per 8 to 16-ounce container. This is the cheese that is typically found in the cheese aisle at your major grocery stores. For instance, a big supermarket such as Walmart sells their Great Value Shredded low-moisture part-skim Mozzarella cheese for $2 to $4 per eight-ounce bag. Kraft, another popular brand, found at most grocery stores, will be in the same range. In bulk, Sam’s Club sells a five-pound bag of shredded cheese for around $12. Wegmans, another popular grocery store, sells their Gluten-free Whole Milk Mozzarella for $2 for an eight-ounce container. For those who want to make their own Mozzarella, the kits can cost anywhere from $20 to as much as $80. For instance, the Roaring Brook Dairy Mozzarella Cheese Making Kit retails for $22. A six portion case, for example, could be more when compared to a pound of cheese. Mozzarella cheese comes in different varieties. For instance, it could be smoked, aged or unaged. It could also be made using skim milk to lower the fat content. Usually, you could see that mozzarella cheeses sold in supermarkets are shredded. It could also be in a form of a bar or packed in a box. Most mozzarella cheese is made from pasteurized milk, cheese culture, salt, enzymes, potato starch, calcium sulfate and natamycin. 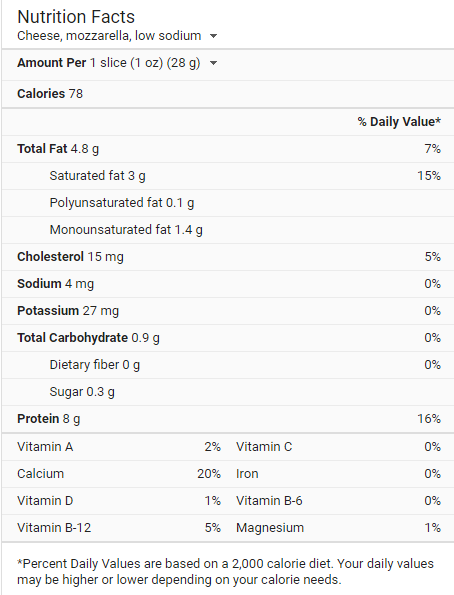 It contains 22% saturated fat and 15 mg of cholesterol. All mozzarella cheeses are shipped to you in a sealed container if you purchase online. That way, freshness is assured and you will not end up with spoiled cheese at your doorstep. Mozzarella cheese can come in large bricks that can be cut or shredded yourself. It can also come shredded to be sprinkled on top of different dishes. If you purchase the cheese from the deli, they can either shred it for you or slice it into a range of thicknesses. If you purchase your mozzarella cheese online, you will most likely have to pay for shipping or delivery charges due to the sensitivity of the item. Because it is perishable, this might be more expensive than the average shipping charges. If you are going to purchase a block of mozzarella, you will need to consider some different tools. There are hand shavers, for instance, that you can use to slice it or you can purchase an automatic slicer. There are also tools that can help you shred your own cheese. Buy aged mozzarella cheese if you want it to last longer. It is drier and saltier. If you want the creamy goodness of mozzarella cheese, buy smoked mozzarella. The flavor is extreme to your palate. Do not store fresh cheese for a very long time. You need to consume it quickly so that it does not spoil and go to waste. Only purchase as much as you can use within the date of expiration. Enjoy the best of what mozzarella cheese has to offer. You could add fresh tomatoes, basil and put it on toast. Add a dash of olive oil and you will be surprised with the explosion of flavors. Do not store mozzarella cheese with other cheeses in the same container. This can greatly affect the taste of the cheese. Put the cheese in a plastic container and put a couple of paper towels. This will absorb extra moisture and keep the cheese fresher for longer. Can you freeze mozzarella? Yes. 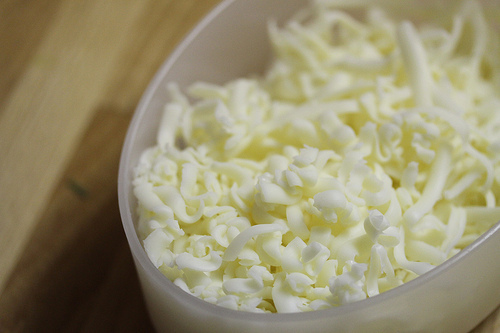 The best options, prepackaged or home shredded mozzarella, is often the best candidates for freezing. When freezing, store in a strong freezer bag, squeeze all of the air out and place inside the freezer. If you were to freeze it while shredding it yourself, then Golden Age Cheese recommends adding a pinch of cornstarch to prevent it from sticking together while inside the freezer. Make your own mozzarella rather than purchasing it. Consider buying a mozzarella kit and make your own mozzarella at home. You could also attend cheese making workshops so you will not have to buy mozzarella cheese. This will also give you some experience in the art so that your mozzarella will be of the highest quality. If you are just looking for a bag of shredded cheese from a name brand company, do not forget to look for coupons and sales at your local grocery store. Like any food, the more you purchase, the more you are going to be able to save. If you can, try to purchase as much as you can up front to save a dollar or so per pound.